I saw those words engraved in the steps of the Hong Kong Central Library, a living monument to civilization that occupies 33,800 square meters of floor space in one of the most expensive retail rent districts in the world. The days I just spent walking through its stacks, holding bound journals in my hands, sitting at crowded tables with fellow inquirers flipping through pages of print looking for answers were among the happiest I’ve spent in all my years in China. The experience reminded me of how much I love learning and provided a much-needed reminder of how many others love it too. The building was flooded with children on school field trips, young adults making use of the free government WiFi, and older folks like me silently engaged in non-trivial pursuits. Hopefully, someday, the ability to consult open public records, meticulously maintained for their own sake at the public’s expense for the public’s benefit will be made available to all of China’s citizens, not just to those lucky enough to reside in this tiny but impressive sliver of the country. I must confess an ironic gratitude for this opportunity to return to Hong Kong – after a very long absence – to a set of fellow Americans with demonstrably less enthusiasm for uncovering the truth. A collection of renowned U.S. China hands and defense analysts recently decided to resurrect a sixteen-year old rumor about the size of China’s nuclear arsenal, which is now circulating in the Pentagon, the halls of Congress, prestigious universities, well-regarded think tanks and the pages of the Wall Street Journal. In all those 16 years none of the experts responsible for perpetuating this rumor, despite repeated assertions of its importance to U.S. policy-makers contemplating reductions in the U.S. nuclear arsenal, ever bothered to take the time to seriously investigate it. Had they been more conscientious, I may not have needed to come here. I would also like to add a word of sincere thanks to my colleague Dr. Jeffrey Lewis for his multi-year effort to convince me to look into this matter. My inquiry is ongoing and, like most scholarly endeavors, will take some time to complete. In the meantime I ask for your patience as I work through what is proving to be a fascinating story whose ending remains unclear. As I walk about the island on my way to and from the library I cannot help wondering how much those American experts really know or care to know about China. And I can’t help thinking that the U.S. policy makers who continue to seek their advice are the kind of people the quote on the library steps is intended to address. Hong Kong was the first stop on my way to study in Shanghai in 1984, and my first step on “foreign” soil. I was the guest of the daughter of a wealthy Chinese architect, there by the grace of her friendship with my traveling companion and classmate from UMBC. We had breakfast every morning in the Mandarin Oriental Hotel, went sailing, attended elegant parties at the Royal Hong Kong Yacht Club and dined at some of the finest Chinese restaurants in the world. I was completely out of my element, stunned by the effects of wealth I could never have imagined without the experience. But what I remember most about my host was the walking tour of his buildings, when he gave voice to his worries about the outcome of the exchanges between Margaret Thatcher and Deng Xiaoping that would return the British enclave to China 13 years later. This is my first trip back to the island since the turnover in 1997. 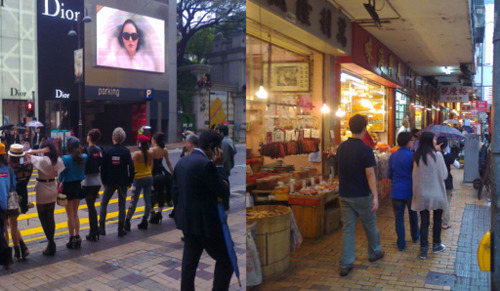 Hong Kong does not seem to have changed all that much despite swapping one set of authoritarian masters for another. The British may have practiced democracy at home but they ruled Hong Kong as a colony, and only became concerned about the right of its people to vote after they decided to abandon them. My classmate now occupies the heights of Central Hong Kong from a perch in a spacious apartment that once housed the government functionaries of the British Empire. The streets are still crowded with shoppers perusing the stalls of small family merchants hawking the ordinary and the exotic. My personal favorite is the dried seafood product stores that give the streets a smell I remember well. Throngs of twenty-somethings rush by on well-maintained subways dressed with the same panache as their predecessors. And two rabidly anti-communist Chinese language magazines that were just getting started in 1984, when Britain’s “iron lady” caved to the “butcher of Beijing,” are still on newsstands everywhere. Some attribute Hong Kong’s continued success to the legacy of British rule. I’m not qualified to judge, but I wonder if the vibrancy of the island’s economy and culture is more a reflection of its people than its government. 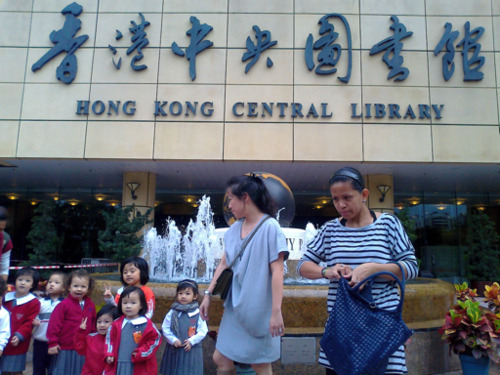 The Hong Kong Central Library was completed in 2001, four years after the turnover.